If you pull the sunroof control lever backward to the second detent position, the sunshade will slide all the way open then the sunroof glass will slide all the way open. To stop the sunroof movement at any point, pull or push the sunroof control lever momentarily. 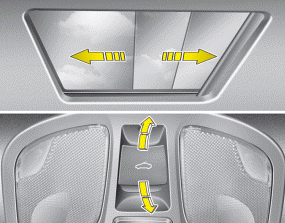 If you pull the sunroof control lever backward, the sunroof glass will slide all the way open. To stop the sunroof movement at any point, pull or push the sunroof control lever momentarily.